Recently Dave “The Godfather” Moody generously allowed me to ask him a few questions about his career, his life, and his views on NASCAR. If you missed the first part, click here. 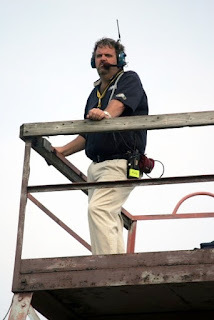 So Moody calls races for MRN around the country, has a radio show five days a week, and has a super late model team. How does he balance it all? While the additional work must be daunting, the show has its rewards. The part Moody considers “absolutely the best thing we do” is Sirius Speedway Legends. Every Thursday, the last hour of the broadcast is devoted to Moody interviewing the biggest names in the sport’s past, from those who have retired, like Cotton Owens and Janet Guthrie to those still involved, like Rick Hendrick and Jack Roush. Moody and his crew have preserved the stories of some of the sports' biggest icons. During those early days with Sirius, the broadcast team “started sitting down...and at first it was really 20 minutes, or half an hour, with Don Garlits and Junior Johnson and Al Unser.” The team realized quickly that 20 minutes just wasn't enough and they expanded it to an hour. “The thing about it is, none of us is going to be here for ever. And every time we do one I say, 'I'm glad we did this while there’s still an opportunity to do it.'" Considering his knowledge of the pioneers of NASCAR, I asked Moody that if he were to pick a fantasy team from the early days of NASCAR, who would it be? What about the next generation of drivers? Who would he pick among the next class of NASCAR stars? That left the Cup series, and I wondered if he thought that the same kind of fix that improved oval racing for the IZOD IndyCar series could work for Sprint Cup? In closing, I tore a page from Moody’s book. Every Speedway Legends interview ends with him asking the person “Nobody lives forever. We’re all going to be gone someday. How do you want to be remembered?” or words to that effect. I posed that question to the Godfather. Many thanks to Dave Moody for sharing his story and his photos with Skirts and Scuffs. And special thanks to his wife, for allowing me to monopolize his time right after he got home. Visit his Facebook pages: Godfather Motorsports, Dave Moody's Fan Page, visit his website at www.godfathermotorsports.com, and follow him on Twitter @DGodfatherMoody. And of course, tune in to SiriusXM Speedway weekdays from 3pm-7pm Eastern (SiriusXM NASCAR channel 90) or listen to the MRN race broadcasts.